Double short handle coloured cotton tote bags. 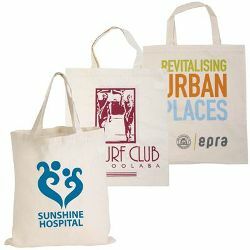 Available in a range of colours at no additional cost as long as print colour remains the same. Printing: Price includes 1 colour 1 position print. White or Silver print recommended on dark coloured bags and Black print recommended on light coloured bags. Pantone colour match not guaranteed when printed on dark colours. White can be underprinted first or double hit at extra cost, call your sales consultant to discuss. Bag colours can vary from shipment to shipment, request samples from current stock.